Frank Y. Gladney, Victoria Hasko and Renee Perelmutter, eds. Joseph Schallert, Jouko Lindstedt, Ljudmil Spasov, and Juhani Nuorluoto, eds. Anastassia Zabrodskaja Ingunn Lunde and Martin Paulsen, eds. 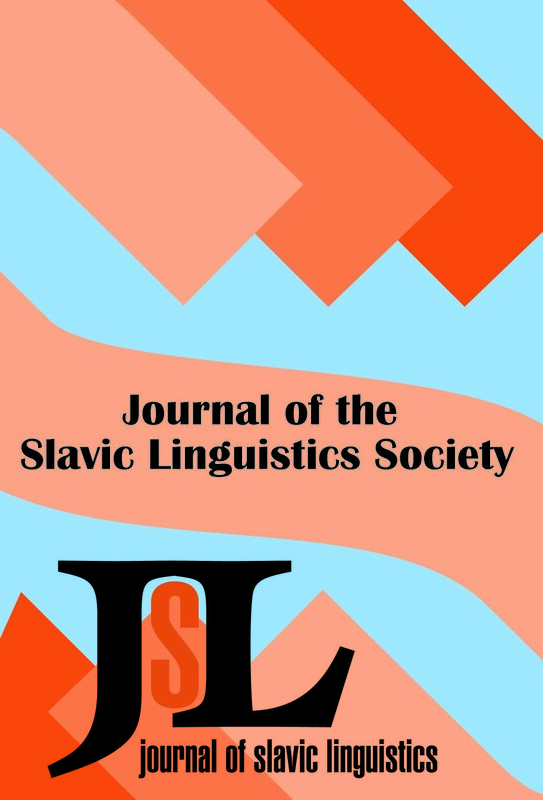 Abstract: This paper applies the framework of Natural Syntax to complex sentences in Slovenian, with the twin goals of introducing the framework to Slavists and showing how it deals with Slavic language data. The framework of Natural Syntax as initiated by Janez Orensnik, in the tradition of (morphological) naturalness as established by Wolfgang Dressler and Willi Mayerthaler, is a developing deductive theory. The naturalness judgments are couched in naturalness scales, which follow from the basic parameters (or "axioms") listed at the beginning of the paper. The predictions of the theory are calculated in what are known as deductions, the chief components of each being a pair of naturalness scales and the rules governing the alignment of corresponding naturalness values. Parallel an chiastic alignment are distinguished and related to Henning Andersen's early work on markedness. Abstract: In this paper, I investigate the notion of speaker indentifiablity, a term that is strongly associated with the pragmatic approach to specificity. Following Haspelmath 1997, I provide evidence from Russian for the linguistic relevance of speaker identifiablity. In particular, I discuss two series of existential indefinites, koe- items and -to items, which are inherently specified as identifiable or not identifiable to the speaker. This specification is shown to be independent of such phenomena as the free-choice effect or narrow scope relative to another operator in the logical form of the sentence. I propose a formal analysis of speaker identifiablity formulated within the framework of possible-world semantics. According to this account, an NP is speaker-world that is compatible with the speaker's worldview. Speaker identifiablity is analyzed as a condition on the relative scope of an existential operator that ranges over individuals and a universal quantifier which quantifies over a s set of possible worlds introduce by the context. I also argue that the speaker (non-)identifiablity meaning component contributed by the investigated items constitutes a conventional implicature. Abstract: This paper describes the qualifying exclamatory construction in Serbian exemplified by Budalo jedna! 'What a fool you are!'. This construction belongs to non-descriptive (or SIGNALATIVE) linguistic expressions which cannot be questioned, negated, or freely modified. The lexicographic description of such expressions has received insufficient attention. We argue that in the above construction the adjective JEDAN intensifies the speaker's negative feelings such that the construction means: 'You are a fool and I feel very negatively about it'. Extensions of the construction include the use of JEDAN with a positive evaluative noun, which produces an ironic effect (e.g. Genije jedan! 'You are the opposite of a genius and I feel very negatively about it') and with a non-evaluative noun, which results in the "transfer" of negativeness to the noun (e.g., Profesore jedan! 'You act as a typical professor [which is bad], and I feel very negatively about it"). Since all these effects are attributable to JEDAN, we describe the qualifying exclamatory construction in the lexical entry for JEDAN.